Course content in graduate school is especially important in terms of helping students make progress toward a doctorate. However, content is merely one aspect of developing successful students. This article highlights the value of creating an affirming learning environment by discussing one graduate class on Qualitative Policy Research. The majority of student participants were graduate students of color. The authors discuss the pedagogical approaches guiding this course and outline ways in which the instructor served to create safe spaces that invited as well as validated diverse perspectives and made the research process transparent. These efforts resulted in the production of high quality research used as pilot studies for successful dissertation defenses, accepted presentations at scholarly conferences, and published articles in peer-reviewed journals. Throughout this article, suggestions for replicating a similar course environment are discussed. 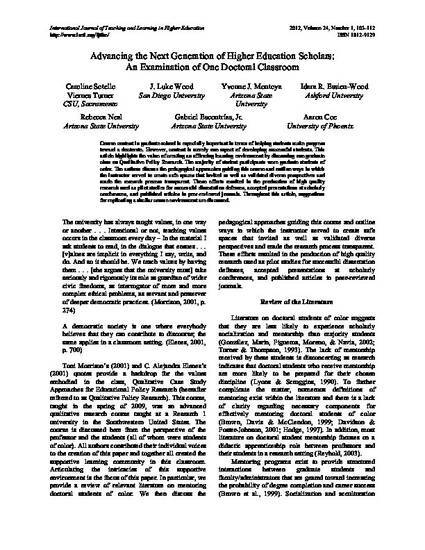 Originally published in the International Journal of Teaching and Learning in Higher Education under a Creative Commons Attribution-NoDerivs 3.0 Unported license.